The Garden Route in South Africa is one of the country’s most iconic road trips. It’s 300-kilometers (190 miles) long and winds past beautiful lagoons, beaches, forests, and mountains. I had such a hard time planning my own Garden Route road trip because every blog post I read was completely different. After personally experiencing it, I now understand it’s because there’s SO much to see and do and countless locations to explore. Technically, the Garden Route stretches from Mossel Bay to the Storms River but, if you’re traveling from Cape Town, you can add on some extra stops along the way! After hours of research, I finally whipped up the perfect 7-day Garden Route itinerary (traveling round trip from Cape Town). Now, I’m excited to share (what I believe to be is) the most comprehensive guide to the Garden Route. I’ve included all of my tips and favorite activities (and even things I wish I had more time for) to help you plan your own trip. Before I share my Garden Route itinerary, here are some essential tips to help you plan your own road trip! What is the Garden Route? The Garden Route is a scenic and ecologically diverse region in South Africa (and one of the most famous road trips in the country!). It stretches 300-kilometers (190 miles) from Mossel Bay (a 5+ hour drive from Cape Town), ending in Storms River. It highlights some of the most stunning landscapes in the country, with epic coastlines, towering mountains, and lush forests. If you’re driving roundtrip via Cape Town, like me, it does add a lot of driving time, but there’s more to see than just the Garden Route! You could alternatively start in Cape Town and end in Port Elizabeth (or vice versa), or drive round trip from Port Elizabeth, to cut out some of the drive time. The best time to drive the Garden Route in South Africa is during the spring or summer. From September to March (and even into early-April), you’ll have long days and warm weather. I’d still recommend packing some warm layers as you’re traveling through different coastal climates. Some of my packing list recommendations are featured later in this post! If you want to catch the Fynbos in bloom, spring is the best time to see the flowers and the season only has moderate chances of rain. July to October is an excellent time to plan a Garden Route road trip if you want to see pods of migrating whales with their calves off the coast of Hermanus! How Long Does it Take to Drive the Garden Route? If you’re traveling to or from Cape Town, you will get the most out of a Garden Route road trip by allocating at least six nights. You could easily do two weeks and still not see it all! If you’re starting from Port Elizabeth, you can technically see the main Garden Route highlights in three days. So, do what you can with the time you have available. Accommodation: Keep in mind that I was traveling with my parents, so my accommodation recommendations reflect family-style accommodation with sleeping for 4. You can look for similar options if you’re exploring the Garden Route as a solo traveler or as a couple. For our Garden Route road trip, we spent between R1500-3600 per night on luxury family-style accommodation. There’s a variety of accommodation for all budgets along the Garden Route from hotels to campsites to self-catering guest homes. Food & Drink: We spent on average R150-240 ($10-18) per person per meal at some of the best restaurants along the Garden Route. However, you can eat for MUCH cheaper, especially if you stay at self-catering accommodation and cook for yourself. A glass of wine in South Africa costs around R40-60 at a restaurant but you can stock up on bottles for R60-R100+. Transport: Petrol will be one of your biggest expenses that you’ll need to budget for when planning a Garden Route road trip. We spent between R4500-5000 (but keep in mind that I drive a heavy 4×4 Land Rover Defender). You could rent a much more economical car and spend about half what we did. Before you touch down in South Africa, check the weather predictions for your travel dates and use that as a guideline to pack for your trip. As I mentioned earlier, the Garden Route is in a coastal region, so you should pack for cooler temperatures, even in the summer. There are countless hikes, rivers, and lakes, so if you’re adventurous, you’ll want to pack accordingly. You don’t need a super crazy hiking boot, but something that will keep you safe and comfortable on long hikes is recommended. Here are some essentials that I recommend bringing along, so you’re prepared for anything! South Africans drive on the left-hand side of the road. If it’s your first time driving on the opposite side, start slow and don’t feel pressured to drive fast. There are also lots of roundabouts, so make sure you brush up on how to safely use a roundabout! As a general rule, on single-lane highways, if you are driving slow or have a car trailing behind you that wants to pass, you should drive slightly (and safely) onto the left shoulder make way and let vehicles pass. Alternatively, you can pass someone in front of you if it is safe and there are no “no passing signs.” The car in front of you will likely pull into the left shoulder to give you more room to pass. Once you’ve completed the pass, turn your hazards on for 2-3 flashes as a “thank you” (you’ll see other people do the same if they pass you and you give them space by pulling slightly onto the shoulder). The main signs you need to know are the speed limit signs with cameras (the speed limit is enforced with cameras & fines), no passing signs, and no stopping signs. Brown-colored signs are for tourism and will usually list turnoffs for rest stops, national parks, wine farms, and major tourist attractions. 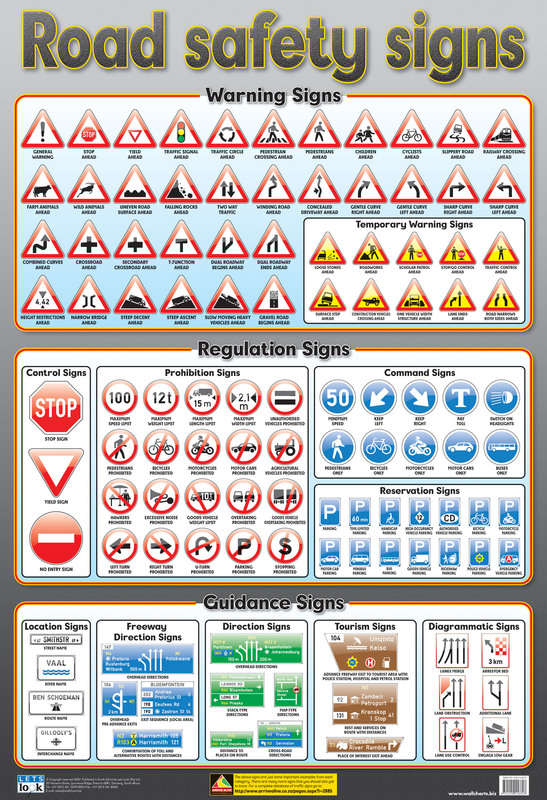 I highly recommend familiarizing yourself with the road safety signs of South Africa. You can also download the image and keep it handy on your phone. Remember that there is no “right” way to do the Garden Route. My itinerary reflects driving round trip from Cape Town, so you can adjust accordingly! Note that in some sections, I suggest adding a night if you have the time! NOTE: Option 1 is technically “out of the way” of the Garden Route. You’ll still be heading in the right direction, but you’ll be taking a more scenic coastal route rather than cutting straight through. You can opt to alternatively do Option 2 and drive straight through to Mossel Bay for safari at Gondwana Game Reserve. Head out of Cape Town in the early morning to make your way to either Hermanus or Mossel Bay. On your way out of town on via the N2 highway, you’ll drive up Sir Lowry’s Pass. It’s a narrow and windy road (so be careful!) but has an amazing lookout at the top. Be sure to stop at Sir Lowry’s Lookout there for sweeping views over the coastline. I’d recommend planning to stop for a coffee and light breakfast at a beautiful farmstall called Peregrine. It’s the perfect place to stop for breakfast, a little rest, and some grocery shopping. They are famous in the Western Cape for their coffee and pies! Once you’ve fueled up, make your way to either Hermanus or Mossel Bay (depending on whether you choose Option 1 or 2)! Option 1: Head to Hermanus! Option 2: Head to Gondwana Game Reserve! After lunch, wander along the sea cliff path and check out all of the local art and sculptures. If you’re visiting Hermanus during whale watching season, the path is the perfect place to see whales and their calves in the cove. The path will also take you through the Old Harbour where you’ll get a glimpse of the town’s colorful history that dates back to the mid-19th century. While we stayed in L’Agulhus, you can do this itinerary anyway you like. If you decide to opt for a stay in Hermanus, here are some of my favorite places to stay! One Marine Drive: I’ve stayed at One Marine Drive on another trip and highly recommend it. Arriving at One Marine Drive in Hermanus feels like coming home. This five-star, family-run, boutique hotel has just five rooms and a staff that is beyond accommodating. Harbour House Hotel: Harbour House Hotel is a luxury hotel that features a 1920 Manor House, modern decor, and a rooftop pool. It’s within walking distance to all the main sights of Hermanus. You’ll want to get to L’Agulhas by 3 PM so that you have time to visit the lighthouse and watch the sunset. Once you arrive, you’ll want to visit the lighthouse first (it closes at 5 PM) before following the wooden beach boardwalk to the southernmost tip of Africa. It is approximately a 1-hour return walk. For sunset, hop in your car and drive about 10-minutes to Struisbaai Harbour. Struisbaai has a famous stingray named Parrie, so be sure to swing by the harbour to say “hi!” Afterward, grab a drink at the Sea Shack and watch the sun go down with beautiful views of the beach. The D’Hub Guest Cottage: This is where we stayed! The D’Hub Guest Cottage is a charming Airbnb property that sleeps up to 4 guests. The newly built guest cottage is a few meters away from the town’s restaurants; it has a sleek and modern interior. Struisbaai Caravan Park: Struisbaai Caravan Park is ideal for budget travelers planning a Garden Route road trip. You can choose to camp or stay in one of the 16 chalets that are right on the beach. You only really need one night in this area if you’re doing the full Garden Route. I’d also recommend looking at accommodation in Struuisbaai; it is a sleepy town but still a bucket list destination. If you’re short on time, you can easily visit Hermanus and Cape Agulhas on a separate trip for a 1-night stay or day trip from Cape Town! Option 2: As I mentioned, you can avoid the coastal route and head to Mossel Bay for safari at Gondwana Game Reserve (which I also highly recommend!). The southernmost tip of Africa was a bucket list trip for me and it made more sense to combine a longer drive around the point and include it in our Garden Route itinerary. If you have the time, you could also stay in L’Agulhus for a night (via Option 1), then drive to Mossel Bay the next day and stay at Gondwana for a night. As I said, there are a million ways to do this road trip! Option 1: You’ll want to leave Agulhas first thing in the morning to make up lost time driving the coast. Most restaurants don’t open until 8-9 AM, so you can hit the road and stop for breakfast in Swellendam at Paradise Organic or Tredici. Option 2: After your morning game drive and breakfast, check out of Gondwana and head to Wilderness. I am absolutely OBSESSED with Wilderness and would recommend adding a night to your Garden Route itinerary if you love camping, nature and adventure activities. We stopped here on our way to Knysna, but you could easily spend 1-2 nights here if you have the time! We opted for an afternoon in Wildnerness and drove on to stay in Knysna. But, if you have the time, add a day to your itinerary and stay in Wilderness! Ebb & Flow North: While we only came for an afternoon, I can’t wait to come back and camp at Ebb & Flow North. You can book a spot along the river’s edge and swim or kayak until the sun goes down. Serendipity: If you’re looking for something a bit more luxurious, look into Serendipity. The Guest House features en-suite bedrooms, a huge fireplace, an expansive library, and one of the best restaurants in South Africa. When I visited Knysna, we decided to stay on Thesen Island. It’s an excellent choice if you’re looking for a more relaxed island getaway, and I had an incredible time! Knysna features an island-dotted lagoon making it perfect for sunset cruises, sailing and water sports. Breakfast at Il de Pain on Thesen Island: This cute bakery has a lovely outdoor patio (if you stay at Lofts Boutique Hotel — breakfast here is included). Dinner at Oysters and Tapas on Thesen Island: This seaside restaurant has a wide selection of Spanish, Mediterranean, and South African tapas-style dishes. It’s a bit “kitschy” but features live music on the weekend and is super popular with the locals. Rent Electric Bikes from Bicycle South: The owners are DARLING, and the bikes are fantastic. They only have two bikes so call ahead to reserve. If you need more than two bikes, there’s another rental shop at the roundabout. Ride the Bikes from Thesen to Leisure Island. A roundtrip cycle should only take about 1.5-2 hours (stopping along the way). Stop on Leisure Island for a Coffee at Nadine’s Corner: They have a super cute garden! Drive to the Viewpoint at East Knysna Heads: It’s an incredible spot for sunset. Eat Lunch at East Head Cafe: They have delicious coffee, seafood, salads, and beautiful views. Book a Cruise Up the Lagoon: There are both lunch, dinner and sunset cruises (the lagoon doesn’t fill until midday so you can’t go out earlier than noon). Book a 2.5-hour cruise (from 12 to 2:30 PM) on a 50 ft monohull yacht for about R1200 per person. If you’re looking for a more romantic excursion, the sunset cruise is a great option. It’s R1050 per person and takes place from 4 PM to 6:30 PM. Visit Featherbed Private Nature Reserve: This 4-hour eco experience costs R701 per person and is a great way to experience the lagoon. The Lofts Boutique Hotel on Thesen Island: All of the rooms at The Lofts Boutique Hotel are the epitome of luxury. Whether you stay in a room with a lagoon view, a luxury loft room, or a unit with self-catering, you’ll feel like you are truly on an island getaway. For bigger parties, you can rent out family apartments. Again, you could easily do 1-2 nights in Wilderness and 2 nights in Knysna if you have the time. They’re both stunning locations with lots of activities! Before you hit the road, spend a half day exploring the rest of Knysna. Plettenberg Bay is very close so you can enjoy a slow start to your day before heading out. If you decide to stay at Boutique Loft Hotel, you’ll get a breakfast voucher to use at Il de Pain on Thesen Island. It’s an artisanal restaurant and bakery that’s won a few culinary awards and serves up delicious European style dishes. We enjoyed a half day in Knysna and cycled from Thesen Island to Leisure Island and back and arrived in Plettenberg Bay later that afternoon. If you head out of Knysna before lunch, pack a picnic and stop at Garden of Eden (between Knysna and Plettenberg) for a short hike and picnic! In Plettenberg, splurge on a stay Emily Moon River Lodge. You’ll want to arrive by check-in (3 PM) and enjoy a slow day down by the river. Even if you don’t stay at Emily Moon, you should stop by for lunch or dinner at Emily’s Restaurant! Guests staying at Emily Moon Lodge can sign up for a canoe trip on the river and enjoy a cocktail at sunset before dinner. Alternatively, you can go to Enrico’s for dinner in Plettenberg. You’ll want to get there before sunset as there are no reservations and it gets PACKED. Emily Moon River Lodge: For our stay at Emily Moon River Lodge, we booked Suite 7 for families, and it was perfect for us! Request an east facing room for one of the most magical sunrises you’ll ever see! Old Rectory: The Old Rectory is a restored national monument built in 1777 that is now an intimate boutique hotel. With only 18 suites, you can expect a very personal experience with plenty to do and see including a sparkling pool, a beach walking distance away, a spa, and an in-house restaurant. I found one night in Plettenberg to be the perfect amount of time for a little R&R! One of the best things about staying at Emily Moon is waking up at sunrise and enjoying the property in the early hours of the morning. Soaking up the quiet and golden stillness of the river was one of the biggest highlights of my Garden Route road trip! After breakfast, pack your bags and head to Robberg National Park. Be sure to check out the lookout deck and do the Robberg Peninsula hike (which is one of the most famous hikes in South Africa). It’ll take anywhere from 4 to 6 hours and is a total of 6km, so bring a picnic lunch to hold you over. Once you’ve finished your hike, make your way to Wild Spirit in Nature’s Valley. Be sure to stop at the local farmstall just before you arrive! The best part about staying in Nature’s Valley is the overwhelming beauty. You don’t have to travel far to find yourself in lush forests that are full of wildlife. We opted to stay at Wild Spirit because it’s one of the most unique backpackers in South Africa. Visit Monkeyland Sanctuary & Birds of Eden: We encountered a rainy day and decided to stop here and were glad we did! Both sanctuaries are great experiences for people of all ages. Go on a Nature’s Valley hike: There’s plenty of trails to choose from to suit all levels. Have lunch at Bramon Wine Estate: This was one of the best meals I had while exploring the Garden Route. Their tapas menu is phenomenal, and the wine is also fab. Have lunch at Fynboshoek Cheese: This place is apparently to die for but be sure to book in advance as they are always very busy! Wild Spirit Backpackers: For a totally unique experience, stay at Wild Spirit Backpackers. It’s a “hippie”-esque forest lodge with options for families, dorm-style sleeping and camping. You could easily skip a night in Nature’s Valley but I wanted to stop here just for the experience at Wild Spirit. If you’re traveling on a budget or enjoy eco-accommodation, you’ll really enjoy it. I met a bunch of cool people and really enjoyed my stay! If you’re looking for a more luxe experience, you can skip this stay or look for alternative accommodation in Nature’s Valley. We started our morning at Monkeyland and Birds of Eden. I was a little skeptical, but it was a rainy day and made for a great activity rain or shine. Both sanctuaries are phenomenal. They are both free-roaming sanctuaries for rescued primates and birds. Storms River is technically the end of the “Garden Route” but we planned to finish in Jeffrey’s Bay. You can stay a night in Storms River and get your adventure on, or press on to experience one of the most famous surf swells in South Africa in Jeffrey’s Bay. We had limited time so, unfortunately, we had to skip over Storms River. It’s one of the highlights of the Garden Route (especially for adventure enthusiasts)! If you have more time, consider some of the activities listed below for this day! If you’re looking for an adrenaline rush and some of the best hiking along the Garden Route, spend a day or two exploring Storms River. It’s home to the highest bungee jump in the world and the famous Otter Trail! Storms River Suspension Bridge: The suspension bridge spans 77 meters over the Storms River Mouth and is one of the most popular tourist attractions of the Tsitsikamma region. Bloukrans Bungee Bridge: After a short 30-minute drive, you’ll hit the Bloukrans Bridge, the world’s highest commercial bungee bridge. If you have the time, spend an extra night along the route to enjoy Storms River to the fullest! We decided to end our Garden Route road trip in Jeffrey’s Bay because my dad is a baby boomer surf bum and had always dreamt of going since the first Endless Summer movie! While there isn’t a ton to do, check out the Surf Village for outlet shopping. Penthouse at Beach Music: We booked the Penthouse at Beach Music which was, to be honest, not the cleanest or fanciest, but the views would be hard to beat! Since we were traveling as a group of 3, this option also slept up to 4, so it was the best “balcony” option for families. Look for other accommodation options near Super Tubes beach for amazing views! African Perfection looked really nice. We also walked past this adorable wooden beach house, and it took me FOREVER but finally found some info on it here! You could easily do 2-3 nights in J Bay if you’re a beach lover too! Don’t miss sunrise in J Bay either! Yewwww it’s unbelievable! Again, if you have the time, take a different route back to Cape Town by cutting through the South African Karoo. Start making your way back to the west coast with a stop in Oudtshoorn. South Africa’s Karoo desert is one of the most unique landscapes you can see! Oudtshoorn is the main town of the Little Karoo. It’s set amongst the Swartberg and Outeniqua mountain ranges and is a wonderful place to spend a night or two if you’re interested in South Africa’s history and the town’s unique landscape. Cango Ostrich Farm: On a tour of the farm, you’ll get to pet the magnificent birds, experience the wine house, and learn all about the history of the farm and what it takes to house ostriches. Cango Caves: Situated in a limestone ridge, these caves are made up of the finest dripstone caverns and vast halls and towering formations. They’re the only show caves in Africa, so it’s quite the unique experience! Equestrian Trails: At the foothills of the Swartberg mountain range lies the equestrian trails that you explore by foot, mountain bike, or horseback. The trails vary in difficulty, so there’s something for everyone. Meerkats! Need I say more? De Zeekoe: De Zeekoe is a self-catering bed and breakfast that features main room houses, cabins, cottages, and a private game reserve. Its name is derived from the Dutch word Zeekoegat which means “hippo waterhole” because over a century ago, those water-loving creatures used to frequent the waterbed that is still on the property to this day. Start your morning early by visiting the local mob of meerkats before you head back to Cape Town. You need to organize a visit at sunrise, so book for the morning following your stay in Oudtshoorn! You can find out more info and book a tour here! Coming up with the perfect itinerary for the Garden Route is almost impossible -there is so much to see and do! Hopefully, my 7-day itinerary has given you some inspiration and made it easier for creating your own incredible road trip along South Africa’s eastern coastline! Do you have any tips for crafting the perfect Garden Route self-drive itinerary? Let me know in the comment below! Great article. Very informative. Well done. Just a note on Day 2 under Things to do in Wilderness. The Eden Adventures canoe hire for half a day is R350 per 2 seater canoe not p.p. Thanks so much for including us.